Description: During this festive one-day class you will learn how to make a table beautiful table runner that is sure to impress family and friends this holiday season. There is no reason to be intimidated by this wreath pattern. We will show you how to fussy cut border fabric to make a hexagon wreath with NO Y-SEAMS! If that doesn’t put this project on the nice list, I don’t know what will! 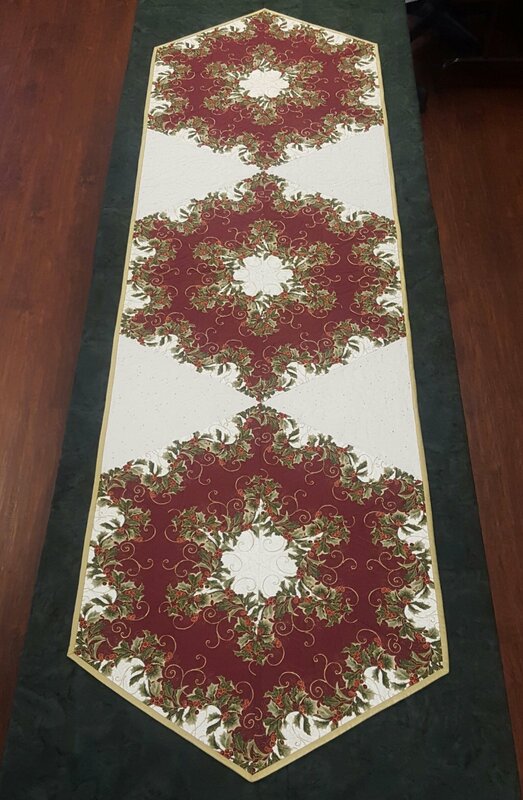 Not only will this make an adorable table or bed runner, we will also discuss how to shorten and change this design to make a table topper to fit any table. This could be the perfect gift you are missing for that someone special (OR yourself) this Christmas! SUPPLY LIST: 12” Creative Grids 60º Triangle Ruler, 3 1/2 yds Border Fabric, 2/3 yd Neutral Fabric, 2 1/2 yds Backing Fabric, 1/2 yd Binding Fabric, Thread, Rotary Cutter and Mat. MACHINE REQUIREMENTS: Basic sewing machine in good working order.